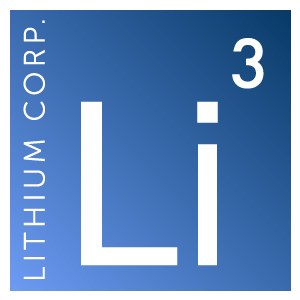 Elko, NV – September 13, 2016 – Lithium Corporation [OTCQB – LTUM] “the Company” is pleased to announce that it has acquired via staking a block of claims on the Salt Wells lithium-in-brine prospect in Churchill County Nevada totaling approximately 3,440 acres. The property is 100% owned and controlled by the company with no underlying royalty. The Company has previously conducted exploration on the property which culminated in a multiple phase – shallow direct push drilling program in 2011. Results from that program were enigmatic, and with the then proposed increase of Federal claim fees, it was decided to put the property in abeyance and concentrate elsewhere. Recent reinterpretation of the results from all previous fieldwork indicates that efforts should be refocused on a target area that was not tested during the earlier work. Field work on this playa outlined a broad geochemically anomalous area where results as high as 750 ppm lithium, and 3920 ppm boron in sediments have been seen. To date the most anomalous lithium-in-brine result from this area has been 36.5 mg/L. The company is currently reviewing all past data, and determining the best course of action for this property. For further information with regard to Lithium Corporation, or our properties please contact Tom Lewis or Brian Goss at (775) 410-2206 or via email at info@lithiumcorporation.com.